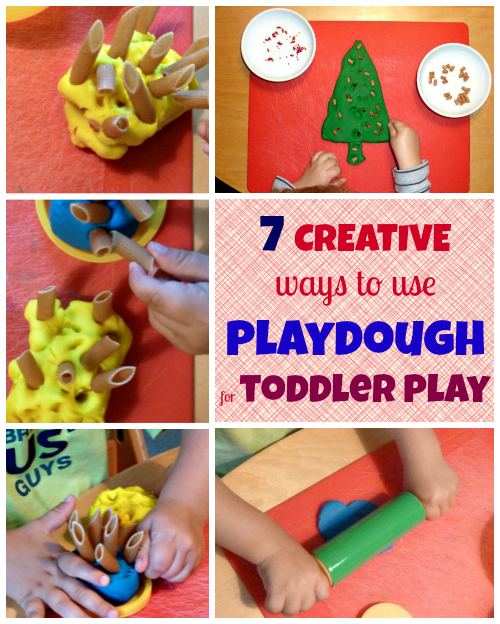 There are many great ways to use playdough for play. Without exaggeration, playdough has been one of the best working options in our home for our toddler when independent play is in the game. Check out these ideas! I simply put playdough on the kitchen table (the best to put it somewhere close, where you can keep an eye on your kid if he's still a little munchkin) and asked him if he'd like to make a ----- [insert the activity from the below list]. I've never yet gotten a NO as an answer! 1) Playdough cookies! Get a few cookie cutters and some playdough and let your kid explore! 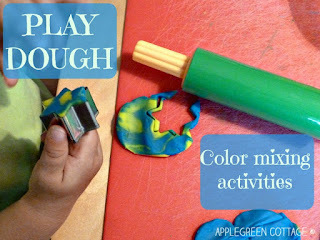 If you combine it with a color-mixing activity like this one at AppleGreen Cottage, it will be even more fun! 2) Cars-in-the-mud: you will soon realize that when mixing playdough colors you'll very often end up with that brown-greenish muddy color of playdough – well, that's perfect, don't throw it away just yet! If you have a boy, it may turn into a giant muddy hill for his tiny cars and trucks! You don't need to add anything else than that, your kid will love it! 3) Making a playdough snowman – especially handy during winter, even when your kid is ill and can't go out play with the snow. You'll need a tray (to limit the play area), three pieces of playdough, and several small pieces that can be used as the eyes, the nose, the mouth, etc – you get the picture. Be creative and use whatever is close at hand. 4) Playdough and pasta! 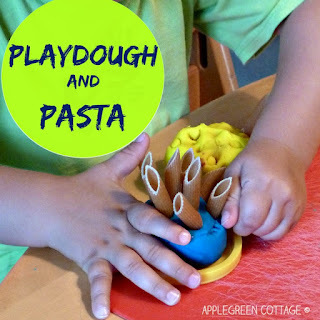 A combination of playdough with small items like pasta provides a wonderful opportunity for not only imaginative play but is also an amazingly effective fine-motor skills exercise. 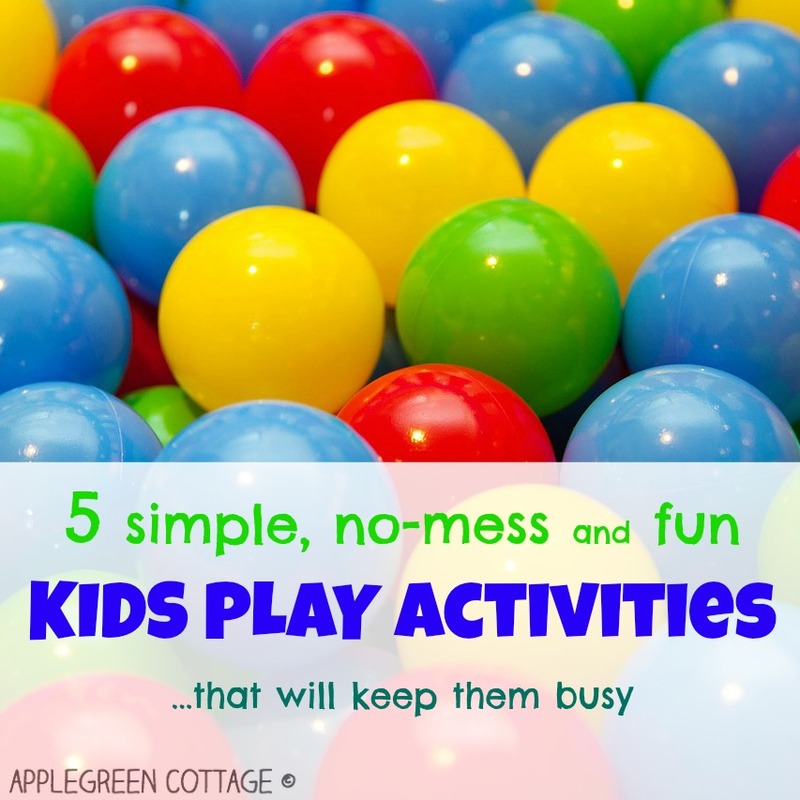 And it's one of the easiest ways to keep your toddler occupied for quite some time! 5) Nature-exploring activity with playdough – making leaf prints in playdough and using rocks to explore the various texture patterns is a great learning experience for toddlers you'll find at Learn-Play-Imagine! 6) Decorate-a-Christmas-tree! 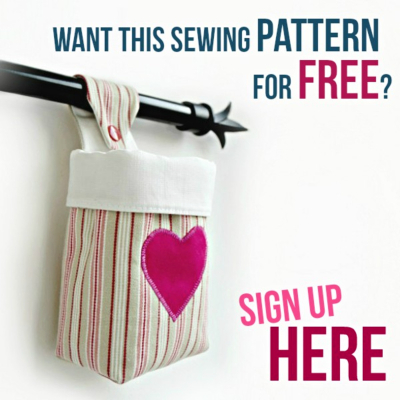 – This is an idea for an easy toddler activity that could most probably be squeezed into your busy December schedule. 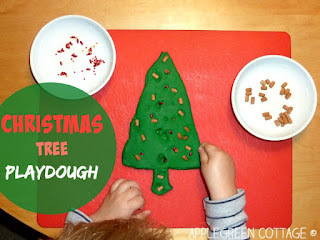 I often call them 1-2-3 activities because they don't take up a lot of preparation time, you just need the idea and the rest is PLAY :) - grab a cup of green play dough and form a triangle from it, placing it on a surface, get some tiny bits and pieces and offer your toddler a 'play dough Christmas tree' and ask him if he'd like to decorate it. 7) Another texture-exploring game is the playdough imprints activity shown by Deb at Learn and Play At Home. 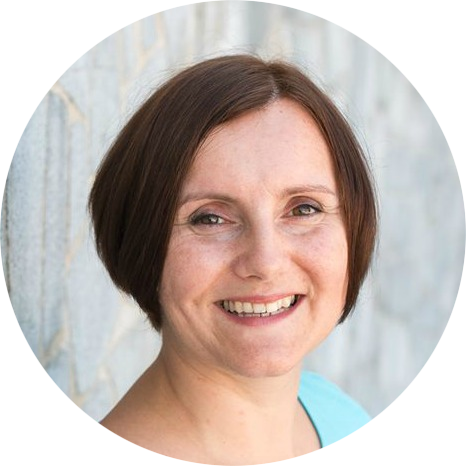 It’s not only a cute sensory experience for kids but also encourages development of fine motor skills, language skills, exploration and textural differences. All important for children learning about the world around them. My nieces and nephews love Play Dough. It gives them freedom to create whatever they want. It helps children develop their imagination. Totally agree! Thanks for dropping by, Heart!